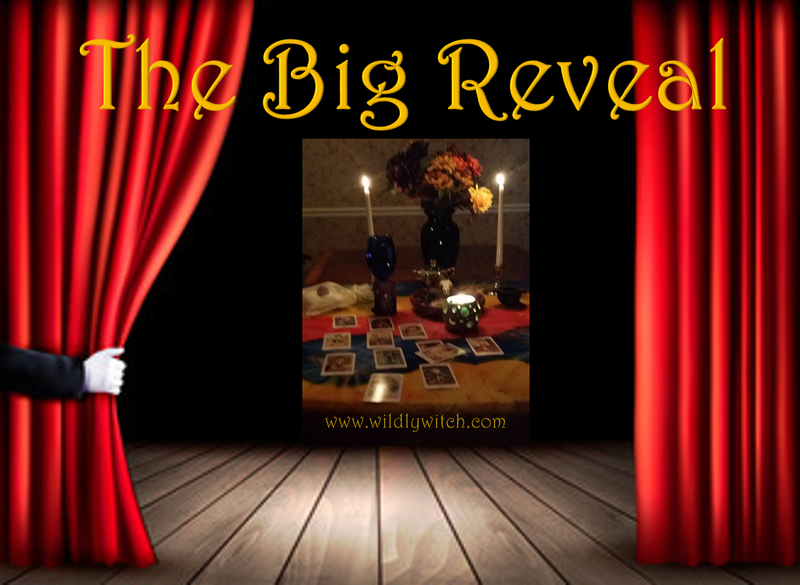 It's time for our Big Reveal! If you haven't chosen your card yet, please go to the Facebook page and make your selection. For those who have, let's get to it! You'll notice something special about the cards this week as well. I swear, I am NOT doing this on purpose! It is not really a surprise if you are ready for it, but the Four of Wands is the Tarot's way of letting you know that there is a surprise on the way and that you are going to be overjoyed by it. The Four of Wands refers to your planning a celebration, birthday or anniversary and yet, a surprise is looming for you. The fact of life remains that we often only see beauty when we are not looking for it. Although a ritual that brings people together to mark an occasion is often meant to be beautiful, it can often consist of just going through the motions. 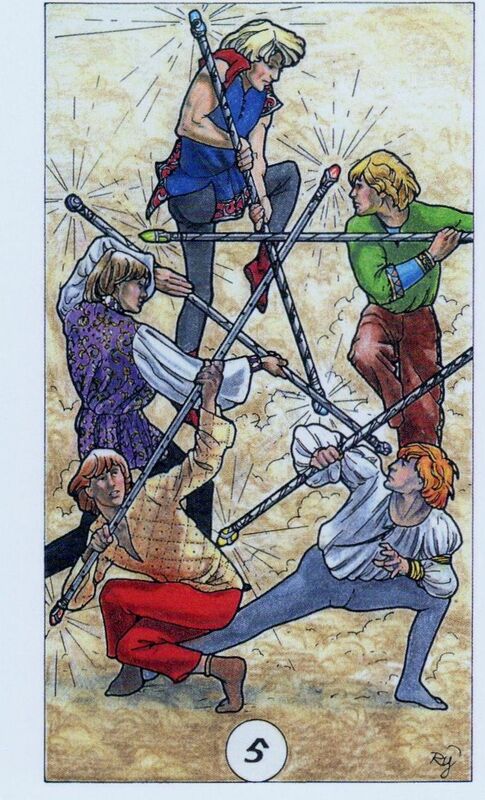 The Four of Wands reveals that you will be surprised how an ordinary get-together will suddenly become one of the most wonderful moments of your life. 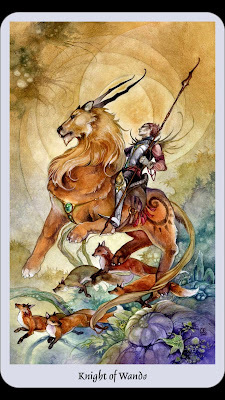 The Knight of Wands in the present position indicates that a new idea or creative inspiration is about to consume you. This could indicate a love obsession, especially if the reality of you and a certain someone getting together would shock or scandalize the neighborhood, friends and family. 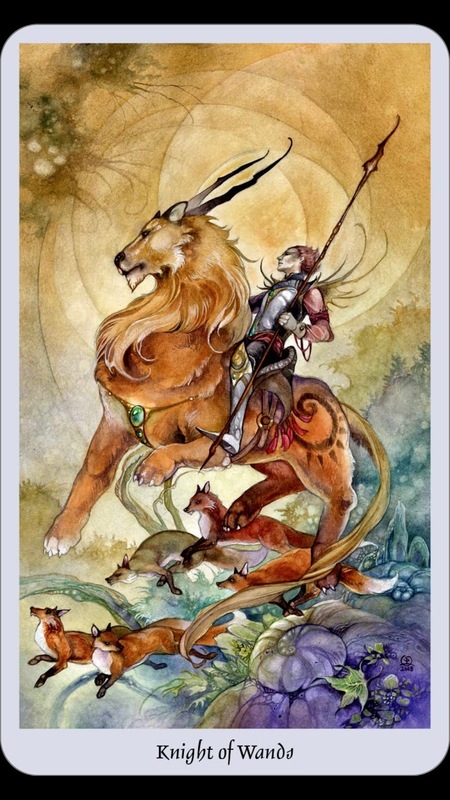 The Knight of Wands appears in the present position when you are strongly considering a relationship with a much younger or older man, or a relationship that is experimental in nature; perhaps your first encounter with another woman. The Knight's inspiration is a flood of intense connections of many ideas and feelings that challenge tradition and the social order. Knights are often message bearers, and in the Wands suit, the messages are likely to be positive and related to work or career. Your projects are likely to be/have been more successful than you would have expected or predicted. In the present position, the Five of Wands means that your life now has many mild dramas and exciting outings, but that they are insubstantial in the long run. Your chances of building a foundation for success will not ever come if you simply remain a pleasure seeker. However, a Tarot reading need not be a lecture. Perhaps you are in the middle of a vacation or have been working hard for years to enjoy the present. In that case, the Five of Wands in the present position is a validation of all your planning and confirms what you have earned. 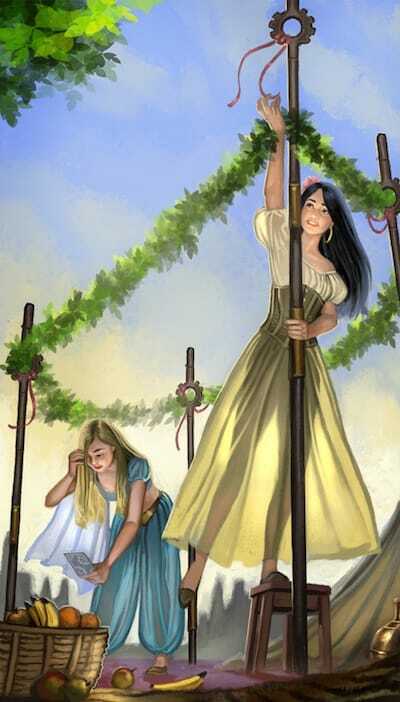 The 5 of Wands often refers to competition. Usually this is in the career/work arena, but sometimes it can refer to romantic rivals. Don't be afraid of competing, know that you have something to offer, and can be successful. But you have to try, to see results. Key words: Conflict, Chaos, Commotion, Unruly, Boisterous, Struggle, Inner Struggle, Lack of Cooperation, Lack of Control, Challenges, Feats, Opposition, Territory, Battles, Skirmishes, Pettiness, Quibbles, Rows, Disagreements, Sparring, Egos, Defensive, Aggressive, Assertive, Conflicting Personalities, No Common Ground, Lack of Team-Work, Pent-Up Energy, Adrenaline, Frustration, Restlessness, Impatience, Dissipation, Petty Problems, Irritations, Bothersome Trivialities, Rough Play, Sport, Games, Competition, Going for Gold, Sales, Brainstorming, Bright-Sparks, Strikes, Protesting. Are you gaining confidence in a new field? Are you starting a new business? Is the feeling of wanting to create something as a means of self-expression building up within you? 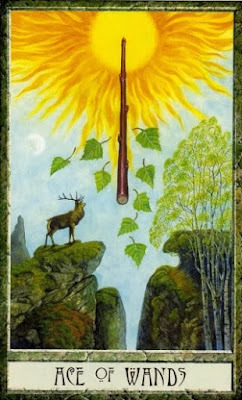 The Ace of Wands is the ultimate card of revealing the creative path that one is on. The Ace of Wands indicates your need to take a definitive stance. Many people who are leaving an old career and beginning a new, risky venture see the Ace of Wands in this position when they receive a Tarot reading. Starting your own business or pursuing the life of a creative artist (be it singing, writing, painting or whatever) is reinforced with this card in the present position. If you are torn about working in a rigid, confining, safe career or breaking out into the unknown and making your own way in the world, the Ace of Wands in the present position guarantees that it is time to abandon all drudgery and blaze a trail of your own. Key words: Physical/Creative/Inspirational Beginnings, Impulse, Stirrings, Spark, Life, New, Potential, Opportunity, Promotion, Gift, Talent, Possibilities, Potential, Growth, Action, Initiative, Ideas, Project, Creative, Inspiration, Initiative, Will, Drive, Ambition, Enterprise, Motivation, Power, Passion, Dynamism, Charisma, Personal Growth, Empowerment, Strength, Spontaneity, Adventure, Magic, Excitement, Fascination, Fired up and Ready to Go, Fast, Acceleration, Momentum, Accepting a Challenge, Race, Bold, Courage, Daring, Risk, Urgency, Thumbs-Up, Green Light, In the Game, Dare to Win, Participation, Confident, Travel, Movement, Motion, One, Single, First, Original, Unique, Maverick, Trail Blazer, Optimism, Fertility, Conception, Birth, New Lease of Life, Positive/Exciting News, Starting Over. How did you do? Come, join us on the Facebook page, where we share our results and support one another. If you're not comfortable with public posting, feel free to drop me a line here, or send me a private message. I look forward to working with you!